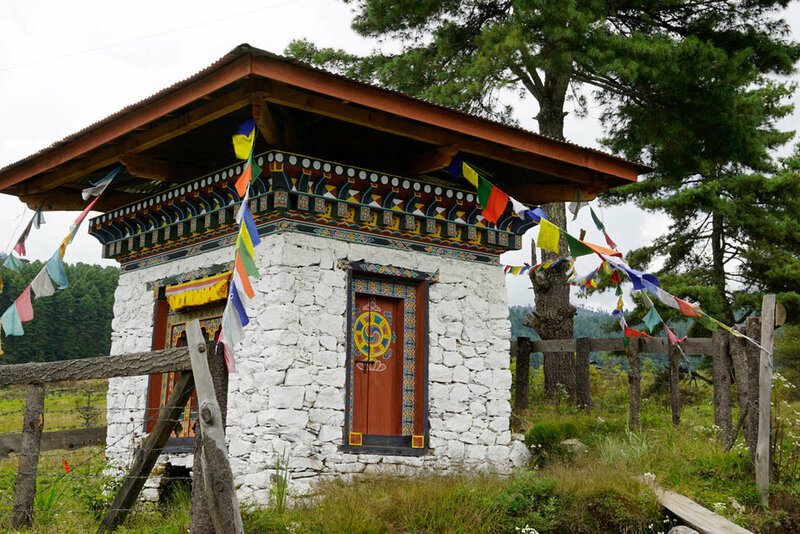 Whether you are crossing the tarmac at Paro's airport while squinting through a brilliant blue sky towards Bhutan's mountains surrounding the landing strip — quite a challenge for planes; trekking on a steep path to a remote Buddhist monastery; or simply strolling along a village road, prayer flags will invariably greet you. Almost rarely out of sight, they form part of Bhutan's unique landscape and cultural identity. Whether you are crossing the tarmac at Paro's airport while squinting through a brilliant blue sky towards Bhutan's mountains surrounding the landing strip — quite a challenge for planes; trekking on a steep path to a remote Buddhist monastery; or simply strolling along a village road, prayer flags will invariably greet you. 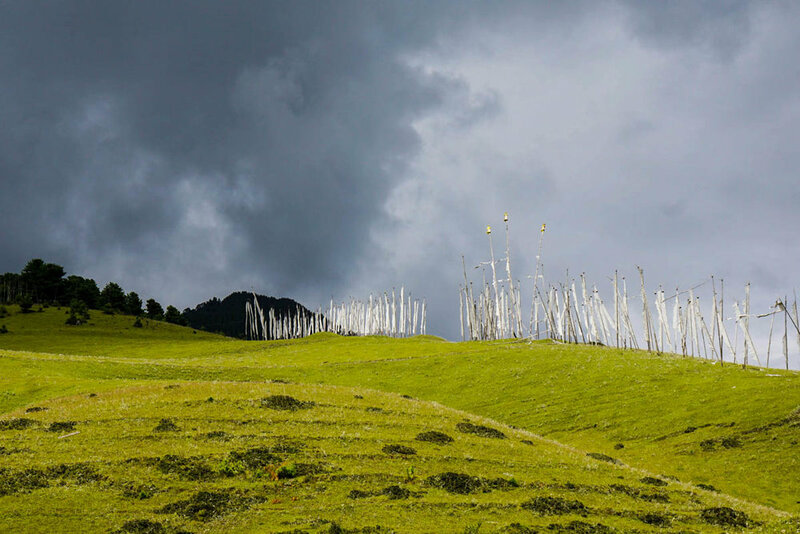 Rarely out of sight, they form part of Bhutan's unique landscape and cultural identity. When I first caught glimpse of the tall, white vertical prayer flags clustered together in, to my naive eye, random places, I flash-backed to walking in NYC's Central Park through a large scale Christo installation of golden flags flapping in the wind on a cold winter day. And while these before me today hold an esthetic appeal, they carry specific symbolic and religious functions, dating back to a more ancient and animistic religion, the Bon. We all are familiar with typical, colorful Tibetan prayer flags. Perhaps we once hung them above our bed in our college dorm or, like a hammock, between trees. Here, with their prayers inscribed on the fabric, they offered solace and joy as I headed up 3000 feet to Tigers' Nest Monastery. As I learned, they also announce a special holy place either in a field or strung from Bhutan's beautiful traditional houses. Each color represents the five elements forming building blocks of both our bodies and the environment. Yellow signifies earth; green, water; red, fire; white, air; and blue, sky. Five is a sacred number for Buddhists as in the five Wisdoms of Buddha, the five Meditating Buddhas, and the five directions. 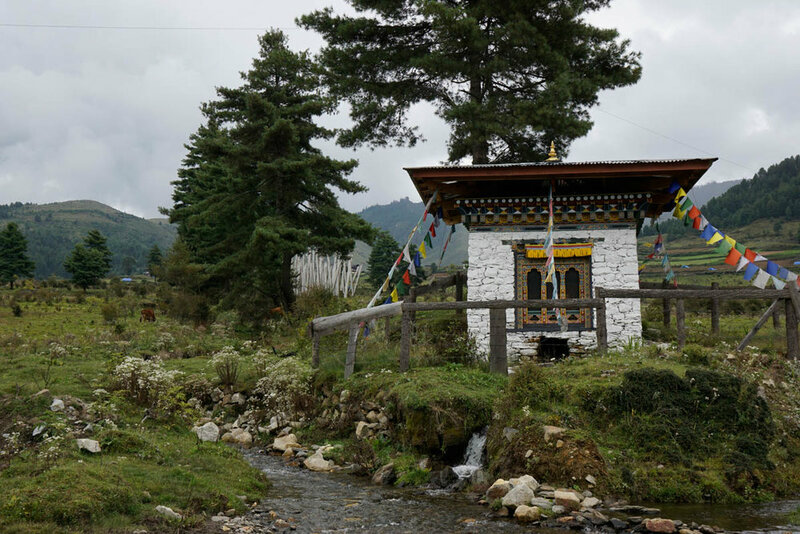 In Druk Yul, Land of the Thunder Dragon, I offered a short overview of Bhutan. My plan was to later share more photographs featuring various themes such as people and architecture. Here now, is a glimpse of its rich, multi-faceted environment: the wild and undisturbed as well as the cultivated and the sacred. 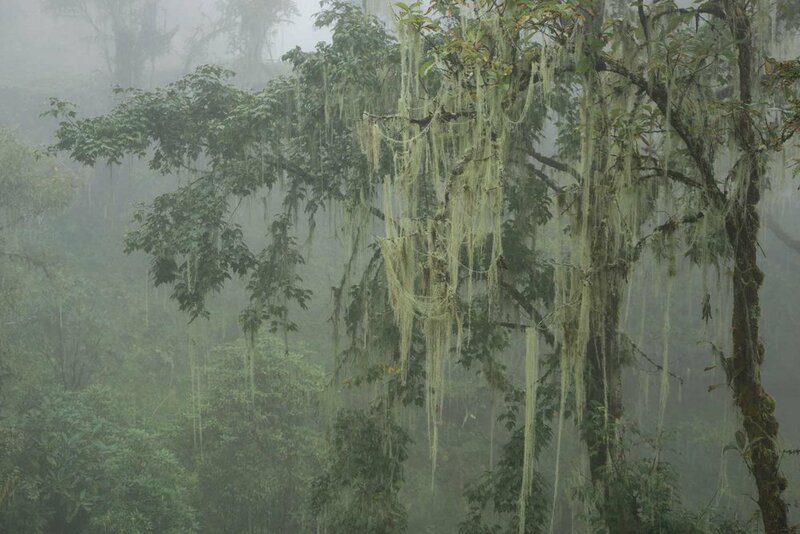 Thus, one might seamlessly transition between old growth forests, where the Old Man's Beard indolently hangs from branches to a broad valley/plateau, Phobjikha, where black-necked cranes overwinter from Tibet to the north. Not far away one might then explore rice terraces and fields of pink barley. With prayer flags on paths to monasteries, another form of cultivation arises. Prayer wheels along streams generated by the flowing water, can also be found. Here religion and nature are interwoven. Finally, it should come as no surprise that mountain peaks are also revered as sacred. 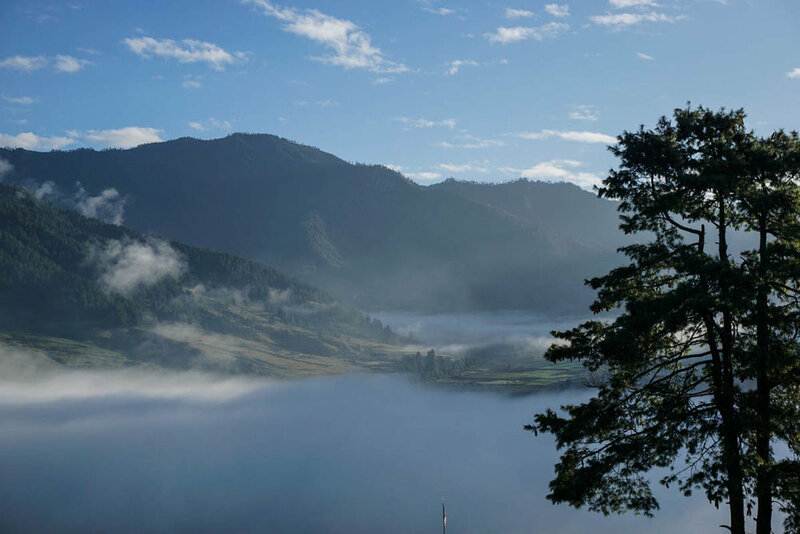 What may appear in the photo above as a vast lake, is the Phobjikha valley enveloped in an early morning mist. Seeing this as I woke up that day was a truly mystical moment for me. The clusters of tall white flags, Manidhar, are erected to honor a deceased person and assist him or her to the next life. As many as 108 — another sacred number, are erected for the optimum transition of a soul. Atop these poles is a small wooden disk symbolizing the lotus blossom and from the disk stands the blade of a wooden dagger, signifying how Buddhist teachings can slice through ignorance and lead the way to enlightenment. Importantly, the wind is a vehicle that disseminates blessings to the world. Prayer flags should never lay on the ground. 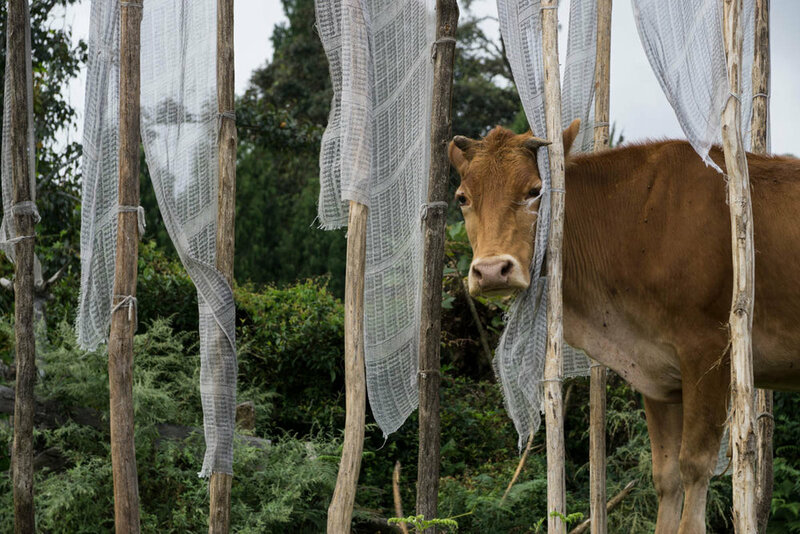 Such delicate looking, sometimes tattered, white flags leading the deceased beyond, are not off limits to cows either. 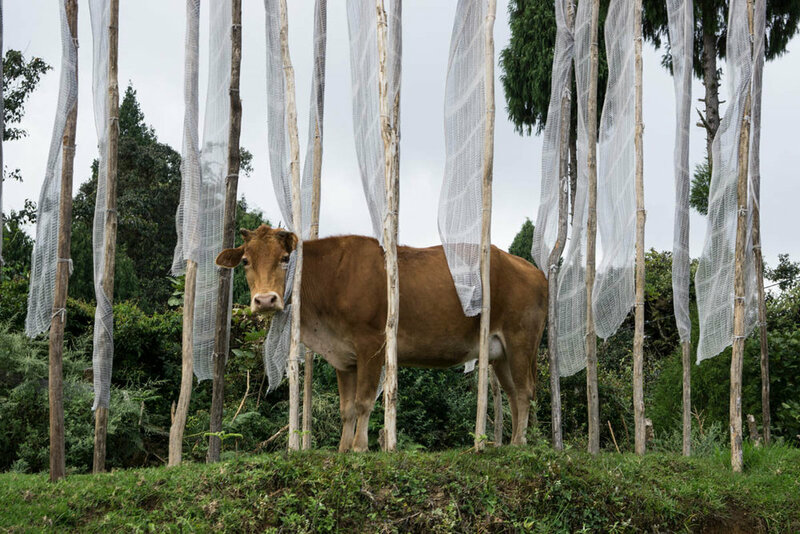 Cows can roam freely in Bhutan; this one found her own particular niche.